In spite of catching a terrible cold just before this meeting, which means a lot of sneezing and coughing, I am otherwise really enjoying the Seventh Birmingham Colloquium, as usual very well-organized by Hugh Houghton, David Parker and others, with good papers, discussions and, above all, good company including old friends and new acquintances. Today there were several good papers and I hope that my own presentation on Mark 1:1 with some emphasis on the patristic evidence counts among them. Jeff Kloha presented on "The NT Text of Nicetas of Remesiana (with special reference to Luke 1:46)" and it turned out that Nicetas attributes the magnificat to Elisabeth instead of Mary in Luke 1:46 (Jeff referred to it as a piece of "unorthodox corruption") – a tradition otherwise reflected in some VL MSS (3 4 11). Kloha identified a textual connection with 3, 4, 11 and 14 in several other passages, e.g., Luke 10:42; John 5:29; 14:13. Kloha suggested that the rather peculiar reading reading "Elisabeth" in Luke 1:46 may reflect a stream of the Greek tradition. The next paper was offered by Claire Clivaz, "The Same Words, but not the Same Readings: Early Christian Readings of Lk 22,43-44." Clivaz opened by stating that after writing 640 pages on this passage (in her published dissertation) she still is confident that new early readings of the passage (=interpretations of the text rather than variant readings) could be discovered. The paper focused mainly on the ambivalence of the noun ἀγωνία from the second century CE onwards, as well as the association of struggle and sweat in a religious context. In my own presentation on the textcritical problem in Mark 1:1, whether the phrase ‘Son of God’ was accidentally omitted from an original or added by some scribe(s), I focused in particular on the patristic evidence (given the theme of the conference), and attempted to demonstrate the marked tendency on the part of some fathers to abbreviate the text. Moreover, I argued for the plausibility of an accidental omission, even in the opening of a book, in the light of observable scribal habits in the extant tradition. Unfortunately, Peter Head, who has written an article defending the short version, wasn't here to argue with me :-(, but another co-blogger from Tyndale House, Dirk Jongkind, stepped in and posed a good question about the correction in Sinaiticus in Mark 1:1 and other corrections in this Gospel, and whether they can be shown to have been made from another exemplar or not. Gary Pence offered the next paper on the "Citations of St. John's Gospel in the Writings of Basil of Caesarea" which was basically a good demonstration of the lack of good critical editions of Basil's various work which are necessar preconditions for further work of evaluating the patristic citations. As the cream on the cappuchino, Ulrich Schmid offered a very stimulating paper on "Marcion and the Textual History of Romans: Early Editions of New Testament Writings and Corpora". It was so interesting that I did not at all mind that he went slightly over the alotted time, and for me personally I would have loved to here more. But, then there was time for lunch and the afternoon excursion to Lichfield Cathedral. More on that later perhaps. 1. How can we reconstruct Marcion’s text? 2. Marcion’s heavy theological agenda may have interferred with other (previous) editorial activity. So how can we tell who has edited what, and when, and for what purposes? 3. What is the appropriate reference point for interpreting editorial variation? We must remember that we cannot deal with individual writings and neglect that they have been transmitted in collections, and a collection is itself an editorial activity. At least one person (the collector) has affected the book in terms of editorial activity. Schmid then went on to elaborate on this challenges and offer some preliminary answers. I will return to that in another post. However, the very quick answer to the first challenge, of course, is to read Schmid's 1995 monograph, Marcion und sein Apostolos: Rekonstruktion und historische Einordnung der marcionitischen Paulus-Briefausgabe (Arbeiten zur neutestamentlichen Textforschung 25; Berlin: De Gruyter, 1995). This fine treatment of Marcion's text of the Apostolos (in Marcion's case the Pauline Epistles) has unfortunately often been overlooked in scholarly discussions. It certainly deserves more promotion. The H. Milton Haggard Center for New Testament Textual Studies (CNTTS), New Orleans, happily announces its receipt of Gordon Fee’s personal textual criticism library. The specialized volumes and other materials have been designated The Gordon D. Fee Collection on the New Testament Text. The collection is comprised of rare and newer books which Dr. Fee amassed in his half century as a text critic. The collection also includes extensive documentation supporting his work on textual criticism projects. Noteworthy is Dr. Fee’s collation files on Luke and John, including his signature graphic depiction of the textual variants. The quality of the graphic depiction of the variants in Luke and John is such that the center hopes to digitize the data, make them freely available, and to use them for the center’s own research. Also included are Dr. Fee’s files on the text of various church fathers. In 2005, Dr. Fee was honored with Evangelical Textual Criticism blog’s Lifetime Achievement Award, 2005 (award; cf. nomination). In donating his collection, Dr. Fee was passionate that his materials be made available for the advancement of the discipline. In this regard, CNTTS is particularly suited to receive the collection. There are currently nine students working toward a textual criticism PhD at the center’s home at New Orleans Baptist Theological Seminary, and 10 part-time researchers at the center. 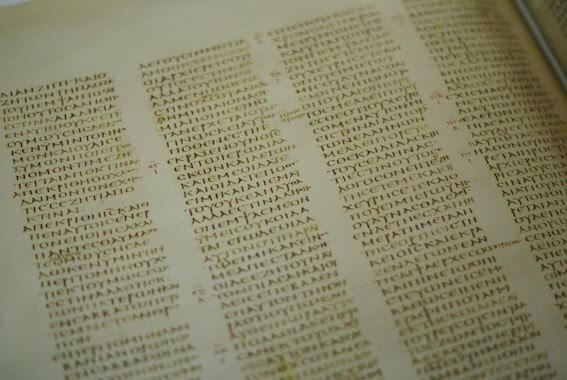 CNTTS has produced its own extensive apparatus of the variants of the Greek New Testament (Bible Works, Accordance), and has commenced a ten year exegetical commentary project on the meaning of the (non-original) variants; the project will be made accessible on the web in due course. CNTTS also cooperates with the International Greek New Testament Project and with the Virtual Manuscript Room project sponsored by the Institut für neuetestamentliche Textforschung (INTF) in Münster. The acquisition was coordinated by James M. Leonard (PhD cand., Cambridge) who is the current recipient of the CNTTS’ post-doctoral research grant as Visiting Scholar. Leonard served as Dr. Fee’s teaching assistant and worked under him in the capacity of Exegesis Assistant at Regent College (1991-1993). Both Leonard and 2008 recipient of the center’s post-doctoral grant Michael Theophilus (PhD, Oxford) studied with Fee at Regent College, Vancouver. If by any means you can spare some time, visit the University Library in Leipzig. There is an exhibition dealing with Tischendorf and his life, the Biblical-manuscript-"Indiana Jones" of the 19th century, from February 18th until May 29th 2011, opened daily 10am - 6pm. See here for more details, interviews, booklets etc. 10.00pm: Coach returns to Woodbrooke. 2.30 pm Dr Wim Hendriks Mark 6:3 : Is not this the Carpenter? 7.00 pm: Optional Conference Dinner (University Staff House), with a presentation on the Staffordshire Hoard. For my first post on ETC, I thought I would introduce my work by explaining the textual apparatus for the new edition of the Hexaplaric fragments, which the Hexapla Institute uses currently. Some changes to it may occur between this draft and the final draft, but this primer will provide the reader with a basic overview. I will use Job 32:1b as a model of the apparatus and I will comment on the function of each line below. LXX: ἦν γὰρ Ιωβ δίκαιος ἐναντίον αὐτῶν. 1. The "HT" is the Hebrew text taken from BHS fifth edition. Though the Hexaplaric fragment does not always agree with this text, it is the base text used for the edition. All variants to this text are discussed in the "Notes" section at the end of each entry. 2. The LXX text is the text of Joseph Ziegler, Septuaginta Iob, Goettingen: Vandenhoeck & Ruprecht, 1982. 3. Line three contains the putative original text and attribution. 4. The "Wit1" line lists all of the available evidence for the fragment. In this case, only the catena mss (listed according to Rahlfs's numbers) preserve the text. C represents the oldest tradition of the Catena of Job and it is best preserved in mss 250 and 3005 among others. cI represents the earliest recension of C, and cII along with 161 and 555 represents the final recension of the catena of Job and is probably the work of Niketas. Unless noted otherwise, C and cI preserve these readings in the margin, while cII has preserved them in the commentary portion of the catena. The down arrows indicate that the witnesses will occur in one or more of the apparatuses below. 5. The "Wit2" line is used for any relevant variants from Ziegler's First Apparatus. Usually, if the Hexaplaric fragment has influenced or interfered with the transmission of the LXX text via the Hexapla, that data will be listed in Wit2. 6. The "Attr" line shows the preservation of the attribution in detail. In this case, mss 250 and 3006 are sine nomine or without attribution. All of the other witnesses from Wit1 contain an attribution to Symmachus as the author of the fragment. 7. The "Var" line shows any variants from the putative original text. In this case, ms 161 has transposed αυτον and δικαιον. I deemed ἑαυτῳ to be the original text on the basis of 250 3005 and 137 (corrected). The variants εαυτων and επ' αυτων arose through assimilation to the LXX lemma. Εαυτον arose through otacism from εαυτων. In this instance, the HT provides a control, since בְּעֵינָיו is singular. The data in Wit2 is from Ziegler's First Apparatus, and it is plausible that Symmachus or one of the other Three has influenced the reading of the O text (i.e. the best representatives of the fifth column of Origen's Hexapla, contained in La and Syh according to Ziegler). 8. The "NonGr" line would list readings from non Greek sources. There is no relevant material in the Arm La Syh or Co for this lemma. 9. The "Notes" section allows the editor to discuss textual decisions, the placement of these readings in individual mss, retroversions from the Versions, and the patristic sources from which these readings arose. 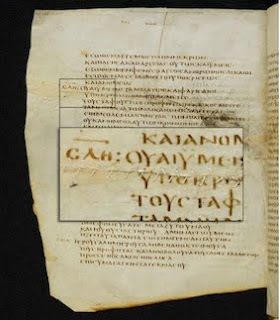 For example at 32:1b, Ziegler's Edition posits that Olympiodorus ("Olymp") is the church father associated with this Symmachus fragment, yet after checking the critical edition of the Olympiodor Kommentar, ed. by Dieter Hagedorn, it is now clear that Olymp had nothing to do with this fragment and his association with this fragment occurred much later, since only the Niketas catena preserves this link; therefore, I did not place "(Olymp)" in the Wit1 line as Ziegler did. At 1:30pm today, I successfully defended my University of Cambridge PhD dissertation entitled "John's gospel: the Coptic translations of its Greek text." 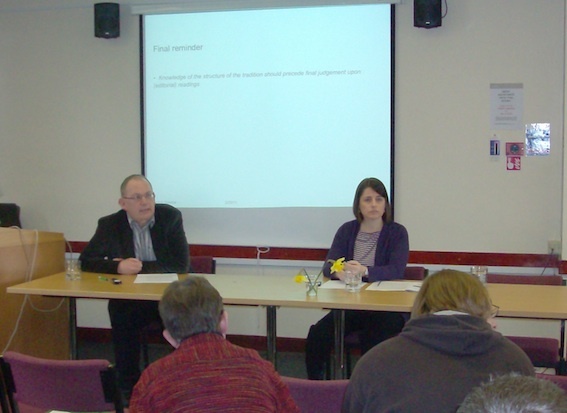 Simon Gathercole was the internal examiner, and Paul Foster (University of Edinburgh) was the external examiner. In the British system, the PhD defense is referred to as the Viva Voce ("with a living voice") or, simply, as the Viva! I am grateful to have found two examiners who were interested in both Coptic and New Testament textual criticism. Both asked a number of lively questions which showed their own engagement with the dissertation. The entire event took about an hour and fifteen minutes. The examiners challenged me to explain the contribution of my research to academia and to respond to some overarching criticism concerning the use of the versions in textual criticism. My dissertation explored the use of the Coptic versions in the reconstruction of the Greek text of John's gospel, considering where the Coptic may be cited with the most confidence. Different chapters evaluated the approaches to translations used, the issues implicit in the source language (Greek) and the translation language (Coptic), the evolution of the Coptic texts over time, and the interrelationships of the Coptic texts themselves. Additionally, I identified two previously unpublished Coptic texts of John's gospel in Middle Egyptian and Fayumic. My examiners have my gratitude for their time and helpful comments. 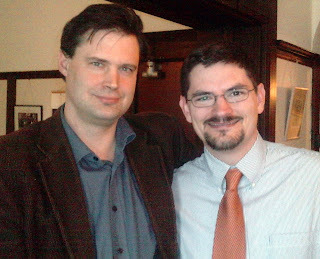 I am additionally indebted to Peter Williams, my supervisor (with me in the photo, above), from whom the original concept of the dissertation came, and who promptly and carefully proofed so many drafts, supplying an endless amount of excellent, constructive criticism. In the final stretch, Gerd Mink transcended the bounds of kindness, reflecting the spirit of cooperation so prevalent in Münster, and commented extensively on the penultimate draft. The highest praise goes to my wife and three kids who endured the ordeal and who have brought me so much happiness along the way. Firstly, the digital facsimile (in low resolution) published by Cambridge University Library can be found here. Secondly, there is a transcription and translation (French and English) here. Kenneth Panten (1995). "A History of Research on Codex Bezae, with Special Reference to the Acts of the Apostles: Evaluation and Future Directions." PhD thesis, Murdoch University. Fourthly, for users of Bibleworks there is a special Bezae module for free download here. Finally, I have arranged a little booksale with Eisenbrauns on the paperback edition of David Parker's excellent study on Codex Bezae (thanks to Wieland Willker for reminding me of the paperback). During a few days you will get a 15% discount on the book here. Readers are welcome to add to this list of resources in the comments. Update: A better Bezae module for Bibleworks (divided in three files) is found here (Greek), here (Latin) and here (some missing pages). 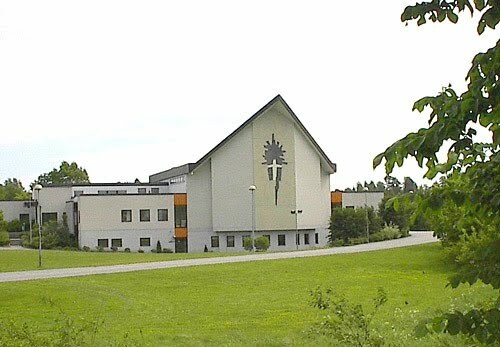 Meade is a candidate for the PhD (ABD) at The Southern Baptist Theological Seminary in Louisville, Kentucky in the department of Old Testament. His dissertation is “A Critical Edition of the Fragments of Origen’s Hexapla of Job: 22-42,” which is also being compiled for the Hexapla Institute, of which he is a part (www.hexapla.org). He has many interests in the area of biblical textual criticism including Hebrew Bible, LXX, Hexapla, NT, and the study of the ancient versions for their interpretation of the text. The ETC team is particularly happy to strengthen its competency in the field of Septuagint studies, and we look forward to many interesting blogposts by John. 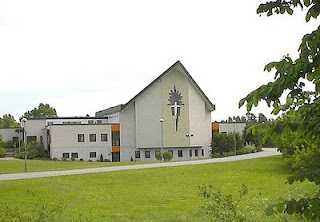 Finally, two monhts after Christmas, Codex Sinaiticus arrives to Örebro School of Theology. Thanks to Maria Brolin for capturing the moment. I preordered this beautiful facsmile copy at the SBL meeting in Atlanta, and it eventually costed £250 including shipping (and I can tell you it's heavy! ), Parker's new book about the codex and a fine print of one of the folios – a very good bargain I think. However, it doesn't beat my Vaticanus facsimile (1968 color edition) bargain, which I got in trade for a Swedish study bible in five volumes, which in turn I had bought at a second hand bookstore for 300SEK (=$46). 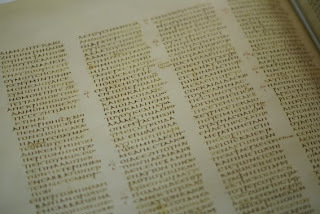 More about the Sinaiticus facsimile here and here.